Climbing Bulldog Motorway during the advanced ride at the November 13th Fat Tire Fun(d)raiser event. August of 2012 will mark the official 25th anniversary of CORBA. In the coming months we will be announcing several ways in which you can help us celebrate. 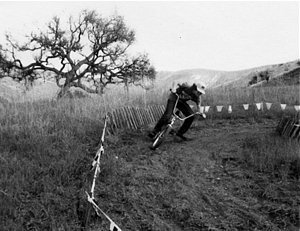 We’ll also be giving you a detailed accounting of what CORBA has achieved for the open space trails in Los Angeles and eastern Ventura Counties and contributed to the mountain bike community. We’d love to hear from you who have stories about your involvement with CORBA, old or new. Photos are most welcome! Please send your contributions to me at mark@corbamtb.com. Happy Holidays! A huge thanks to all of you who donated your time, products, and/or demo bikes to this year’s event. It was a huge success, with nearly 200 attendees. The weather cooperated, everyone enjoyed the rides, there was great energy, we got out the message about responsible riding and CORBA’s advocacy work, and we raised a good chunk of change to go toward our programs. It’s the support of the bike industry that validates what we do as advocates, so thank you thank you thank you! For photos of the event check out our photo gallery! For many years, most trailwork has been done by volunteers because of budget cutbacks at our parks systems. So come out and help CORBA and other volunteers keep our trails in top riding shape! You can learn more about what to expect and what you'll need to bring with you on our Trailwork web page. Keep in mind that CORBA now provides prizes and lunch after the event for volunteers who register in advance! And by registering in advance, you'll help us prepare by knowing how many volunteers to expect. If you come out to two or more trailwork days in a year, we'll give you a cool long-sleeved CORBA trail crew shirt - be sure to ask for yours! Saturday December 3: Gabrielino Trail. We will be working with the Mount Wilson Bicycling Association and other groups to help restore the Gabrielino Trail between Switzers and Redbox. There are a number of sections of the trail that need to be rebuilt from washed out drainages, some brush that needs to be cut back and cleared, and a lot of debris on the trail. The work will be weather permitting, so if there is a threat of rain, check here the night before. See the rest of the details. Please RSVP to trailcrew@corbamtb.com. Sunday December 4: Rim Trail. We will clear the trail of brush, re-establish the bench and clear slides in several places. See the rest of the details. Please RSVP to trailcrew@corbamtb.com. Saturday March 10, 2012: Dead Horse Trail in Topanga State Park. Details are forthcoming. 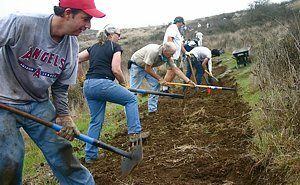 Saturday March 24, 2012: COSCA Spring Trailwork Day. Details are forthcoming. Fri-Sun April 27-29: State Trails Days in Point Mugu State Park. Details are forthcoming. To see all trailwork dates, including those of other groups, visit the CORBA trailwork calendar. Join our mailing list to get updates on trailwork opportunities! We have heard of other trail projects that are being planned. We will provide details as we learn them. Open space. City parks. Thousands of miles of singletrack across all 50 states. If you value those things, you will take just 60 seconds to help IMBA support the Land and Water Conservation Fund (LWCF). All you have to do is sign a petition. The petition asks the Obama Administration to fully and permanently fund the LWCF and its work buying open space and helping cities and counties build parks, many of which contain mountain bike trails and are in your own backyard. TAKE ACTION! If we reach 25,000 individual signers by Dec. 16, the Obama Administration will look at the issue and give an official response. Please sign today! LWCF funds are being diverted from their intended use. Of the $900 million authorized this year, very little of that is actually going toward America’s parks and outdoor recreation areas. Be part of a united voice. Help us urge the White House to restore full, dedicated and permanent funding for the LWCF. It only takes a minute. Sign the petition today! The National Park Service is conducting a “special resource study” of portions of the San Gabriel River watershed and the San Gabriel Mountains. The purpose of the study is to determine if the area would be an appropriate addition to the national parks system. The process started in 2005 in a series of initial scoping sessions. In 2009 the first draft alternatives were presented for public comment, as we reported in 2009. After the 2009 series of public hearings, the alternatives were revised and released In October 2011. The report is an extensive 300 page document. It discusses a broad spectrum of the natural, cultural and recreational resources in the study area. For those interested in the geologic, cultural and natural history of the San Gabriels it is a handy reference, well worth reading. The document further describes the national significance of the resource, and ultimately finds the region suitable for NPS protection. It discusses the feasibility of NPS involvement, then presents the alternatives as to how the NPS may be involved. CORBA supports the report findings. We agree that the area is a unique resource suitable for inclusion in the National Parks system. Conceptually, we support Alternative D for a number of reasons. It protects resources over the largest area, improves recreational opportunities, has the most positive socio-economic impact, and fosters a more cooperative management between the various land managers in the study area. It provides opportunities to expand and link wildlife and recreational corridors through urban areas. It provides resources to urban communities to expand and improve their open space and recreational opportunities. Honor and maintain existing trail-use designations and permitted activities with the ANF and other open spaces in the proposed NRA. State that if resource protection necessitates a recreational use or activity be discontinued, viable alternative locations for those uses or activities must be provided so as not to diminish already limited recreational resources. 2011 Fat Tire Fun(d)raiser – Thank you! For a list of upcoming recreational rides, please visit the CORBA Calendar. Next CORBA Kids Club ride will be Saturday December 3rd at Sullivan Canyon. See our Rides Calendar for details. 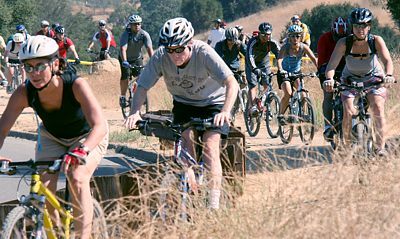 CORBA’s Recreational Rides calendar provides a full monthly schedule of mountain bike rides for all skill levels. Mountain bike rides are organized by CORBA member clubs and led by experienced and knowledgeable guides. 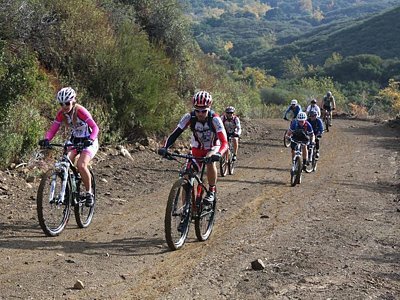 Recreational rides are a fun and social way to experience a variety of trails in Los Angeles and Ventura counties, and beyond. Saturday December 3rd is the next skills clinic. The CORBA free skills clinic is held on the first Saturday of every month at Malibu Creek State Park. Mountain biking is a lot like tennis or skiing. Just a few minor adjustments in technique can make a huge difference in your control and proficiency. If you want to get better faster, you need to know the fundamentals of mountain biking technique. Whether you're just getting into mountain biking or have been riding for years, you'll learn some valuable tips from our Introduction to Mountain Biking skills class that is offered each month. Check out our Skills Clinic web page for all the information. After the clinic, see photos of your new skills on the CORBA web site that you can share with your family and friends! We have set up accounts with Twitter and Facebook to help keep people informed of the latest developments in our trail advocacy, recreational rides and trailwork days. Follow us on Twitter at twitter.com/CORBAmtb and Facebook at facebook.com/CORBAMTB. Have you ever wished you could get our blog articles without having to check the CORBA website every day to see if there’s anything new? Well, you can! Even though our blog software won’t send articles by email, you can still get them delivered to the inbox of most email readers like Microsoft Outlook. You use the “RSS feed” functionality for this. In fact, you can read our articles in any software that receives RSS feeds, such as Internet Explorer and other web browsers. This blog article on RSS feeds shows you how.